“In all speculative episodes there is always an element of pride in discovering what is seemingly new and greatly rewarding in the way of financial instrument or investment opportunity. The individual or institution that does so is thought to be wonderfully ahead of the mob. This insight is then confirmed as others rush to exploit their own, only slightly later vision. This perception of something new and exceptional rewards the ego of the participant, as it is expected also to reward his or her pocketbook. And for a while it does. As to new financial instruments, however, experience establishes a firm rule, and on few economic matters is understanding more important and frequently, indeed, more slight. The rule is that financial operations do not lend themselves to innovation. What is recurrently so described and celebrated is, without exception, a small variation on an established design, one that owes its distinctive character to the aforementioned brevity of the financial memory. The world of finance hails the invention of the wheel over and over again, often in a slightly more unstable version. All financial innovation involves, in one form or another, the creation of debt secured in greater or lesser adequacy by real assets. This was true in one of the earliest seeming marvels: when banks discovered that they could print bank notes and issue them to borrowers in a volume in excess of the hard-money deposits in the banks’ strong rooms. The depositors could be counted upon, it was believed or hoped, not to come all at once for their money. There was no seeming limit to the debt that could thus be leveraged on a given volume of hard cash. A wonderful thing. John Kenneth Galbraith, "A Short History of Financial Euphoria"
As further proof that I don’t pander to readers, I’m back this week with additional monetary theory. “The world of finance hails the invention of the wheel over and over again, often in a slightly more unstable version.” I doubt Dr. Galbraith ever contemplated global central banks injecting Trillions of new liquidity directly into securities markets. Clearly, this cycle has seen absolutely momentous policy innovation – some subtly and much spurred obtrusively with post-Bubble policy convulsions. Understanding the nuances of the latest and greatest “reinvention of the wheel” provides a constant analytical challenge. Financial innovation occurs more subtly and incrementally. Pay really close attention or you’re bound to miss it all. There are variations of financial instruments, institutions, market norms and government involvement. Success, real or perceived, ensures the envelope is pushed – in the markets and with policy. As we’ve witnessed, cumulative incremental policy experimentation over time can result in fundamentally revamped doctrine. In the markets and in real economies, incremental (“frog in the pot”) changes over the life of protracted booms can amount to profound transformations. And that is exactly what’s been experienced with “money” and monetary management. The nineties saw the age-old issue of fractional reserve banking completely turned on its head. The “evolution” to market-based Credit fashioned what I refer to as the “infinite multiplier effect” – “money” and Credit created, miraculously, out of thin air like never before. With their implicit government backing, the GSEs enjoyed unlimited capacity to issue new debt liabilities – fed by insatiable demand from both home and abroad. During the mortgage finance Bubble, Wall Street relished in the capacity for seemingly limitless issuance of “money”-like mortgage- and asset-backed securities, most guaranteed by the GSEs that were backed by the federal government. The phenomenal policy response to the bursting of the mortgage finance Bubble unleashed the “global government finance Bubble”. The world has now seen the evolution of unfettered electronic “money” advance to its final act, with profound yet unappreciated ramifications. For the past twenty-five years, each new Bubble has seen the scope of “money” widen to the point of ensuring Credit expansion sufficient to reflate increasingly impaired financial and economic systems. Yet each reflationary episode only compounded global financial imbalances and economic maladjustment. These days, concerted desperate reflationary measures see perilous expansion at the heart of “money” and at the very foundation of global Credit. When, in the early-nineties, the U.S. banking system (impaired from “decade of greed” excess) had lost the capacity to create sufficient “money” (largely deposits), an extraordinarily accommodative Greenspan Fed ensured that non-bank “money” (largely “repo” and short-term GSE liabilities) creation took up the slack. Over the years, I’ve argued that booms fueled by high-risk “junk” bonds don’t warrant undue concern. Invariably, the marketplace’s response to over-issuance includes a waning appetite for risk. Demand for new junk debt begins to dissipate, ushering in a period of Credit tightening and risk aversion. Importantly, attention to risk and attendant finite demand for increasingly risky debt instruments work to limit the duration of the boom cycle. This ensures that excesses and resource misallocation have insufficient time to impart deep structural maladjustment. The market pricing mechanism promotes self-regulation and adjustment. Importantly, it goes unappreciated that “money” is incredibly dangerous when compared to even high-risk Credit. Money is special. Enjoying insatiable demand, “money” is prone to gross over-issuance. It is for the most part detached from market regulation and self-correction. Moreover, when this “money” gravitates to asset and securities markets, resulting pernicious inflationary effects are either ignored or misunderstood in policy circles (in contrast to traditional consumer price inflation). Credit is inherently unstable. The perceived stability of money masks a dangerously capricious nature. Governments widen the domain of perceived money-like instruments at the system’s peril. There are heavy costs that come with printing Trillions, guaranteeing market liquidity, monkeying with risk perceptions and directly inflating securities markets. Once commenced, a self-reinforcing cycle of monetary over-issuance (“inflation”) will be sustained so long as confidence holds. Indeed, global “do whatever it takes” monetary management has had momentous effect on market faith in “money” and the perceived safety (“moneyness”) of risk assets worldwide. In desperation, the world’s major central banks have resorted to the “nuclear option” of issuing Trillions of new “money” backed by nothing more than their willingness to create endless additional quantities. Also unique from a historical perspective, central banks inject this new “money” directly into securities markets. Distortions to global markets and economies have been unparalleled. Having evolved incrementally over decades, the previously unimaginable is today accepted as reasonable and rational. Central bank “money” – along with pledges to print as much as necessary - dictates market behavior like never before. As a long-time market analyst, I can attest to profound changes in the way markets operate. Traditionally, a boom experiences progressively riskier behavior. The quality of Credit issued over the course of the boom deteriorates - as the scope of speculation and leveraging elevates. Risk grows exponentially in the boom’s final phase. As such, it is the riskiest segments of the marketplace that are to be monitored closely for indications of a cycle’s turning point. Risk aversion at the “periphery” traditionally marks an infection point. Simplistically, the expanding quantity of Credit required to sustain the boom inevitably confronts the harsh reality of waning demand for increasingly suspect Credit instruments. Traditional analysis, however, has been usurped by the phenomenon of concerted unfettered central bank “money” printing. These days, stress at the periphery ensures ever more aggressive monetary inflation. And with today’s specter of incessant global financial and economic fragilities, market operators appreciate that policymakers are trapped in a policy of round-the-clock liquidity injections and market interventions. Persistent trouble at the “periphery” and latent fragility at the “core” cultivate history’s most prolonged global Credit and speculative cycles. Growth in the global leveraged speculating community took off in the early-nineties. The Greenspan Fed had slashed rates and aggressively intervened in the government debt markets. There’s another very important aspect of Monetary Analysis that also evolved from the nineties. As market-based “money” and Credit took shape in the U.S., the unfolding Credit boom had a profound impact on the world’s monetary anchor. Globally, persistently huge U.S. Current Account Deficits unleashed a dollar liquidity onslaught. This profoundly altered the incentives and general backdrop for financial speculation. On the one hand, easy “hot money” returns began spurring spectacular booms and busts (i.e. Mexico, the Asian “Tigers,” Argentina, Iceland, etc.). On the other, an unstable late-nineties global securities market backdrop propelled “king dollar” and increasingly precarious U.S. securities Bubbles. The U.S. “tech” (and king dollar) Bubble burst in 2000, provoking previously unthinkable monetary stimulus. I would strongly contend that without the unsound dollar (and Fed policy), the world would have adopted a more skeptical view of the euro monetary experiment. And without such a strong euro (relative to the dollar), Greek and the European periphery debt would have never enjoyed The Curse of Moneyness. It would be a different world today. The latest and (to that point) greatest U.S. Credit boom burst in late-2008/2009, unleashing only more egregious monetary inflation. By this point, monetary mismanagement and ongoing massive Current Account deficits ensured a deeply flawed global “reserve currency”. This extraordinary backdrop was fundamental to the perception of “moneyness” for China’s currency and Chinese Credit more generally. Only in a highly abnormal global monetary backdrop would the marketplace afford a strong Chinese currency in the face of a four-fold surge in Chinese bank Credit (not to mention “shadow” liabilities) to $28 Trillion. Only a defective global financial system would ascribe “moneyness” upon Credit instruments fueling the greatest economic maladjustment, asset inflation and systematic corruption of all-time. The ongoing historic Chinese Credit boom has forever changed the world. The piece was actually less about oil and more about how cheap Chinese textiles smuggled into the country destroyed Nigeria’s domestic textile industry – and the communities it supported. I couldn’t help but to ponder how global monetary mismanagement, oil and commodities price booms, and massive Chinese overinvestment have conspired to wreak bloody havoc around the world. While the weekly expansion of radicalism garners headlines, Greece remained the markets’ focus again this week. Basically, there remains some concern for “Grexit,” although market participants have been trained to heavily downplay such risks. And, sure enough, it appears a compromise has been reached that will at least kick the Greek can down the road for a few months. And, interestingly, the analysis does come back to money. Fundamental to sound money is that debts do settle. One cannot just accumulate debt and expect confidence in the underlying obligations to hold forever. The problem these days is that it’s quite difficult to identify good money to throw – or, better yet, to save for a rainy day. What Would Happen if Greece Leaves the Euro Zone? Banks across Europe, including the European Central Bank, are preparing for the possibility of Greece leaving the euro zone. With Athens and Brussels still at odds, such an eventuality seems more realistic than ever. But how disruptive would a Grexit really be? On Wednesday of this week, 30 top managers at a large German bank all received a text message and an email at the exact same time. A short time later, their mobile phones rang with an automated voice giving them all passwords and a number to call at exactly 8:30 a.m. to join a teleconference with the board of directors. The communication blast was the initial step of the bank's emergency "Grexit" plan, a strategy laid out in a document dozens of pages long detailing exactly how managers should react in the event that Greece leaves the euro zone. Each of the 30 bank managers were required to work through the emergency measures pertaining to his or her division. Information was to be transferred to the supervisory board and public officials were likewise to be kept informed as was the German Finance Ministry. The plan also called for large investors to be put at ease. Questions pertaining to potential bank losses from Greek bond holdings were to be addressed as were changes in monetary transactions with Greece once it was no longer part of the common currency zone. The response also extended to internal bank communication, with instructions to employees for dealing with the new situation posted in the financial institution's intranet. Customers and stake holders were also to be kept informed. At exactly 6 p.m., the crisis came to an end, as did the work day. Plan "Grexit" was just a dry run, nothing more. At least not yet. Such scenarios are being acted out across Europe these days as companies, banks and governments all prepare for the kind of worst case scenario that isn't even addressed in euro-zone statutes: the exit of one of the common currency area's member states. On Thursday, Greece's new government under Prime Minister Alexis Tsipras finally applied for an extension to its bailout program. But, from the perspective of German Finance Minister Wolfgang Schäuble, he failed to fulfill the conditions laid down by the Euro Group. Chancellor Angela Merkel spoke on the phone with Tsipras and negotiations have continued, with the next major round scheduled for Friday night. But even if a compromise is found in the end, the game of high-stakes poker will not be over. Both sides would have to agree to a new plan for nursing the country back to financial health. Greece's creditors, now known as "institutions" rather than the "troika," will not just have to reach agreement with Athens on interest rates and payback periods, but also on issues such as the minimum wage and increases to retirement benefits. A possible "Grexit," as Greece's potential euro-zone exit has come to be known, would loom over the talks the entire time. Such negotiations would be far from simple. On the one side are supporters of Tsipras' left-wing populist Syriza party, many of whom still live in the 1970s-era world of communist splinter parties. On the other side, the 18 euro-zone finance ministers have joined together to torpedo Tsipras' campaign promises. Syriza wants to increase public spending while the Euro Group wants to reduce it. Athens plans to increase the number of civil servants while the Euro Group believes public spending should be cut further. The Euro Group believes the privatization of publicly held assets should be a priority, but the Tsipras government has put the program on hold for the time being. The climate is a poisonous one. For weeks, Prime Minister Tsipras and Finance Minister Giannis Varoufakis have presented their euro-zone partners with billions in demands without providing a single realistic proposal for how the plans should be paid for. Finally, Schäuble gave the Greeks an ultimatum in the notoriously wobbly English he often uses when things get serious. "On February 28, 12 p.m.," he said "is over." Indeed, Schäuble seems at times to be playing the role of a strict father trying to keep his rebellious teenager in line. Many Greeks, though, have felt humiliated by the tone of the debate and it is hardly one that is appropriate for the task at hand: that of finding a compromise between two semingly irreconcilable positions. Success depends largely on Tsipras making concessions. To be sure, he may well be granted interest rate relief or be allowed to improve social conditions in Greece. But he would also have to agree to continued austerity and to implement the reforms demanded by his country's creditors. And that would be the exact opposite of what he promised Greek voters during the campaign. The only other option would appear to be Greece's departure from the common currency union, the possible effects of which both sides are busily calculating. What would abandoning the euro do to the Greek economy? How high would the costs be for the euro zone? What would be the political consequences were Athens to turn away from Europe? 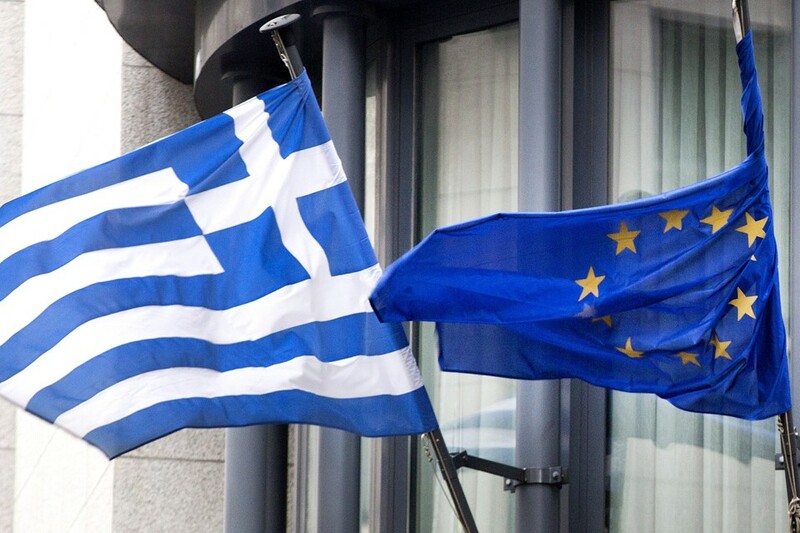 The European Central Bank (ECB) is also preparing for a possible Grexit. Officials are busily performing internal simulations to determine how the rest of the euro zone could be kept together if Greece goes. ECB officials believe that chances of a Greek exit have increased in recent days and, despite their strenuous denials, are urging Athens to finally implement capital controls in order to stem ongoing capital flight. Every day, Greeks are sending in excess of a billion euros abroad, the ECB believes. Everyone involved insists that they don't want Greece to leave the common currency union. But it could ultimately become unavoidable if the political chasm between Athens and Brussels proves unbridgeable. The party's heart beats on Koumoundourou Square, though the fact that it is still beating is rather astounding given the thick cloud of cigarette smoke that permeates the seven floors housing Syriza's headquarters. The high-rise is located in the heart of Athens' Chinatown. The party leadership is in parliament to elect a new president during our visit. But the party's base camp, the cafeteria on the first floor, is full. The prevalence of experienced functionaries, men with gray stubble and corduroy sport coats, all of them communists who insist they "are not dogmatic," is notable. One of them is 61-year-old Alekos Kalivis, a member of Syriza's politburo, a labor union leader and a retired bank employee. "The Germans and the European elite want to suffocate us," he says, taking a long drag on his cigarette. "Why? Because they don't want Greece to become a precedent." And what if the Euro Group remains unconvinced by such arguments? "They have to be convinced, otherwise it would be as if the election hadn't taken place. We can't, in any case, accept any solution that requires us to abandon our principles." "Even if we fall in battle," Georgia Filiou, who works in the café, yells over from the sink, "then we'll fall with our heads held high." She dries her hands, goes over to her laptop and begins talking about the "180 billion that you Germans still owe us from the war." The Syriza headquarters is its own world. Internationalist, but somehow screened off from the outside world and unexpectedly homey. It is a political refuge where the old certitudes still exist. But it is a refuge that has given birth to the new government of a European country in the 21st century. And it is a refuge that gives Tsipras the support he depends on. How many disappointments can his followers absorb? "I have waited my entire life for anger against the system to reach the middle classes," says Vassilios Primikiris. "Now it has." The 63-year-old anesthetist spent the Greek military dictatorship in Italian exile. Now, he is in Syriza's central committee. He says that Syriza is doomed to succeed and insists that the Tsipras government still has leverage in Europe. "A Grexit would be the most expensive solution for all involved," he says. And afterwards, he continues, the sharks would begin searching for fresh prey such as Italy or Spain. "Ms. Merkel," Primikiris says, "is Europe's gravedigger but it only appears as though Tsipras is as isolated as Iphigenia. He's not. And it is Agamemnon, the ruler, who will die." Valdis Dombrovskis is a shy man. The new vice president of the European Commission is a trained physicist and has acquired the reputation in Brussels for being one of those politicians who only speaks when he has something to say. Furthermore, the 43-year-old from Latvia knows how to navigate a country through financial difficulties. When the Baltic state became engulfed by the financial crisis in 2009, Dombrovskis was prime minister and he immediately reduced the number of civil servants on the government payroll by 30 percent and cut the salaries of those remaining by 40 percent. Two years later, his country's economy was growing once again. "You convince the financial markets that you are serious about the adjustment and you restore financial stability," he told the BBC in 2011, explaining Latvia's success story. Now, Dombrovskis is Commissioner for the Euro and Social Dialogue and has opted for a strict approach to the debt dispute with Greece, a position he justifies with his own political past. "According to the program, Greece only receives funding under certain conditions," he says, "and that will remain so after March 1 as well." Dombrovskis doesn't understand the Greeks. Prior to elections in January, the situation had been improving in the country. The government in Athens was bringing in more money than it was spending -- at least once interest payments were factored out -- and the economy was growing. The Organization for Economic Cooperation and Development (OECD) recently noted the country had made "impressive headway." At the time, Athens would have had good chances of receiving new aid from Brussels, which would have created greater maneuvering room for the government to make its own decisions about its budget. But Tsipras' election radically altered the situation. Many Greeks either stopped paying taxes or paid less in anticipation of the tax cuts he promised during the campaign. Meanwhile, companies slashed investments out of fear of the leftist government. The result is that now the holes in the national budget are as big as they were before. Sources in Brussels say that the first steps taken by the new Greek government have destroyed any hopes for greater leeway. "Now there is no other option left for the Greeks but to apply for a comprehensive third bailout program," one Brussels insider says. And Dombrovskis, the man who had for years preached austerity and sacrifice to Latvians, is showing little inclination to bend over backward for the Greeks. It's a position shared by many finance ministers. The coming negotiations, a source in the Euro Group says, "will be tougher than anything we have experienced up until now." As the chairman of the Greco-German Chamber of Commerce, Athanassios Kelemis' job is to attract as many companies to Greece as possible -- at least during normal times. At the moment, though, even Kelemis is finding it difficult to promote his country. Without a clear outlook, he says, he can only advise companies against investing their money in the country. "Everyone is waiting to see what happens," he says. "2015 will be a lost year for the Greek economy." Although the subject of Greece's exit is supposedly not a topic of discussion in talks between Athens and Greece, in reality all are considering the possibility -- either by accident or by dint of a realization that it may be the lesser of two evils. If Greece were to stumble out of the euro, the government would have to circulate a new currency overnight that would immediate depreciate in value against the euro. At least initially, it would result in chaos. Banks would totter dangerously, interest rates would quickly climb and companies would go bankrupt. The number of insolvencies would rise by 50 percent in 2015 and again by an additional 30 percent the following year, predicts Ludovic Subran, the chief economist for credit insurer Euler Hermes. Even the country's largest electricity utility company, state-owned PPC, would likely go bankrupt, predicts rating agency Standard & Poor's. In order to prevent people from making a run on the banks, the country would have to temporarily introduce controls on money flows. Transfers abroad would be banned, limits would be placed on withdrawals from automated teller machines and supplier contracts would be suspended. It's possible that medicines and foreign food products would only be available on the black market and that they could be purchased exclusively with hard currencies. One potential consequence of the devaluation would be that Greek government debt would rise from the current level of 175 percent of gross domestic product to 230 percent, analysts at Germany's Commerzbank believe. Athens would no longer be able to service the debt on a large portion of its loans and the country would be at least partially insolvent. It's difficult to predict how people would respond to such a situation. Argentina's declaration of bankruptcy in 2001 was followed by violent riots and looting. The Argentina example also shows how long it can take for an economy to recover from a crisis like that. Tens of thousands of Argentinians, many of them well educated, left their country, and many Greeks would do the same. The faith of international investors would also be shaken. It is likely that the Greek government would have trouble raising money for years to come. At the same time, a new, cheaper currency could also create some opportunities. It would suddenly make Greek exports a lot cheaper. Hans-Werner Sinn, president of the Munich economic think tank Ifo, believes, for example, that the country could resurrect a textiles industry that disappeared a few years ago. The country could also make gains with cheap vacation deals. Currently, many holiday destinations in Greece suffer because prices are cheaper in neighboring Turkey, where the skies and seas are just as blue. "The Greek tourism industry, in particular, would strongly profit from a Grexit," says Thomas Mayer, who formerly served as Deutsche Bank's chief economist. The question here is the degree of stimulus this would provide to the exports and tourism sectors. More important yet is the question of when the boom would begin. The Kiel Institute for the World Economy (IfW) doubts whether Greece would benefit from the drachma's reintroduction in the long run. "A clumsy devaluation would do absolutely nothing to change Greece's structural problems," says Stefan Kooths, head of IfW's forecasting center. The International Monetary Fund has a similar view of the situation. Sources at the IMF in Washington say they believe the cost of exiting the euro would be greater for Greece than continuing with reform measures. But changing currencies could provide one key advantage for the Greek government: It could print as much money as it needed to finance the promises it made during the election campaign. The risks of a Grexit for the entire euro zone are manageable and the ECB would use all measures at its disposal to defend the currency union. On the political side, the European Stability Mechanism, the euro backstop fund that has already proven to be an effective instrument in providing countries emergency funds, can be used should there be a spillover effect. The majority of the half-trillion euros in the fund has not been touched. The IMF has praised the Euro Group for building a "fire wall" to prevent Grexit-related turbulence from spreading to other countries. Most important, however, is the fact that the countries on the periphery of the euro zone are no longer as susceptible to risk as they were during the outbreak of the euro turbulence in 2010. Yields on Spanish and Italian government bonds might increase slightly following a Grexit, experts at Commerzbank predict, "but there is no danger of a crash." It would, however, lead to financial losses for the countries that lent Greece money. Partner countries, the European bailout fund and the IMF have provided €240 billion to Greece. Germany either directly or indirectly guarantees almost €65 billion of these loans. If Greece were to leave the currency union, a large part of this money would never be seen again. Still, such losses would hardly be noticeable in the coming years. With interest payments and amortization of the bailout loans having been suspended until 2020, Greece is doing very little to service those debts right now. Germany wouldn't have to book any of the losses until much later. But the Greeks could produce costs elsewhere. As an EU member, Greece is eligible to apply for so-called "balance-of-payments assistance" from Brussels. Such assistance is available to EU countries outside of the euro zone that run into trouble. Hungary and Latvia are examples of countries who have taken advantage of such assistance. The political damage, of course, would be much greater. A Grexit would represent a significant political defeat for European leaders. For the last five years, they have tried to keep Greece in the euro zone at almost any price. Were the country to leave the euro, there is a danger that it could begin to orient itself more toward Russia or China. In the final analysis, leaving the euro zone would be an almost incalculable economic risk for Greece, but one which could pay political dividends. The reverse is true for the euro zone. As such, it is hardly surprising that cracks have become apparent in the Greek facade in recent weeks. Greek Finance Minister Varoufakis, for example, has made several concessions to his European counterparts only to see his prime minister withdraw them again. Europe, too, has been anything but unified. Whereas European Commission President Jean-Claude Juncker has sought to find a compromise on his own, German Finance Minister Schäuble has often acted as though his preference would be for Greece to leave the euro zone. Even Sigmar Gabriel, head of Merkel's coalition partner, the Social Democratic Party, has expressed his opposition. The best option for all involved remains that of finding a compromise. After the difficult structural reforms it has introduced in recent years, it would be extremely difficult for Greece to confront the additional pains of a currency reform. The euro zone, in contrast, has no interest in allowing Athens special rights that no other country could claim. A deal remains possible, but the longer the negotiations last, the more doubtful it becomes if both sides are willing to make the sacrifices necessary. Those leading the negotiations on both sides have made clear that they don't have much room to maneuver. "Greece can no longer fulfill the demands of the program," Tsipras says. "That is why it must be modified." Chancellor Angela Merkel, for her part, said: "Solidarity and exertion are two sides of the same coin." And they did. Whole new industries were built around personal computer hardware and software; new service categories appeared; and eventually the Internet emerged. Some 25% of the job categories in the government statistics did not exist in 1970 (if I remember correctly – it’s somewhere in that neighborhood). If you go back to the late 1800s, farmers were still more than 40% of the labor force. Fast-forward 100 years and that figure was less than 3%, but the remaining farmers were producing vastly more, feeding not only the US but much of the rest of the world. Meanwhile, most of the people displaced from farms had to find jobs that had not been invented in 1900. The twentieth century was a good time for middle America. A lot of the new manufacturing jobs paid reasonable middle-class wages. Like me, many of you grew up in those middle-class homes (though mine was decidedly on the lower end of the scale). It was a good life and a great time to grow up. Prior to our lunch, I had just read the essay that is this week’s Outside the Box and was in a reflective mood. While it is easy for me to glibly talk about how entrepreneurs will create the jobs of the future, it becomes a little bit more personal when I think about my seven kids and now six grandkids and what their jobs might look like. We are clearly watching what we’ve called the “middle class” shrink. There appears to be a bifurcation between those jobs for which high-level skills are required and those that can be easily filled by just about anyone – or by a more or less intelligent machine. Yes, there is a rise in small, artisanal, entrepreneurial businesses like bakeries and breweries, but those don’t create large numbers of middle-class or high-paying jobs. Further, for the first time in American history we are now seeing more businesses close their doors than open them in a given year. We have made the barriers to creating new businesses so high that we are choking off the lifeblood of future employment, which is the wellspring from which a society creates value and opportunity for all of its citizens. Travis and I talked about the tremendous opportunities in robotics and automation and the almost mind-boggling advances that are being made each year. We are truly entering a Brave New World, but it is one that is disintermediating jobs almost as fast as the McCormick reaper and the tractor and other agricultural technologies did. In the past, increased productivity and new technologies created whole new areas of employment. While I am the most optimistic guy in the room about the future of the human experiment, there are times when I wonder whether the future might not look like something out of the novels of William Gibson, the creator of dystopian cyberpunk fiction. I hope not. I hope that Ian Banks is right instead, and the future holds fabulous opportunities and essential abundance for all. I certainly think that the basic necessities of life, including healthcare, are going to be relatively inexpensive in the future, much as our telecommunications have become, as costs have plummeted in the past couple decades. Just as our phones became digital and cheap, healthcare will become digital and easily available. Maybe not as soon as we would like, but that is the future we’re heading toward. But what do jobs look like in that world? In his essay called “What Uber Could Teach the American Economy,” my friend Sam Rines speculates that the world of work will look quite different in the future. His essay is not that long, but this week’s Outside the Box will really push you to think. I am back in Dallas, and tonight I will go with Worth Wray to attend Kyle Bass’s Hayman Capital annual client dinner, where there will be lots of discussion about the future as well as about today’s markets. Tomorrow I give a speech for S&P here in Dallas, where we will be discussing the future of the investment industry. The glib, short take is that the industry will be better, cheaper, and faster, and in 10 years will look quite different. That’s good for customers but not so good for brokers and advisors who don’t change with the times. That automation I was talking about? It’s coming to an investment firm near you. The old models are going to give way to new ones. If you are in the business of running money, you need to be figuring out how to create the changes, not be run over by them. Stay tuned. Have a great week. I am already thinking about this week’s Thoughts from the Frontline, where we’ll be talking about the growing amount of debt in the world and its impact on future global growth. It’s not just robots that we need to be worried about. America's employment picture has certainly improved — but major challenges related to wage growth and part-time work remain. Yet, one company has an employment and pricing model that might offer solutions. The ride-sharing technology company Uber understands more about the U.S. economy than it is given credit for. Consider Uber’s use of surge pricing. Sometimes you need surge pricing and surge pay to balance supply and demand. Surge pricing gets more drivers on the road, and makes people think twice before requesting a ride. It also allows the Uber driver to determine to a great extent when, how long and where they work. 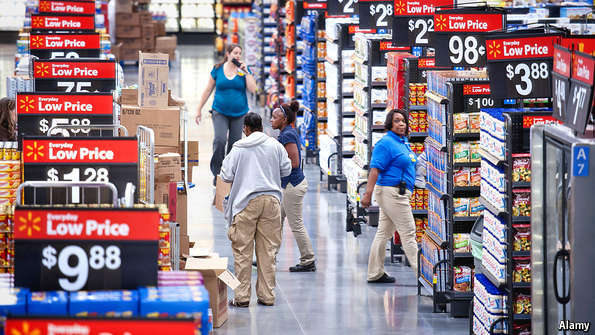 Traditional businesses do not have surge pay to adapt to increases in demand and attract workers—overtime and signing bonuses do not adjust supply in real time. Unfortunately, the United States as a whole is not as nimble an operator as Uber. The labor market is an intriguing mix of good and bad news. On the positive side, the unemployment rate is 5.6 percent, employment is above the pre-Great Recession peak, and employment growth has been steadily increasing for a couple years. Worryingly, the JOLTS report indicates the United States has 5 million job openings, the United States is facing stagnant wage growth, a plummeting labor-force participation rate and part-time employment remains a stubbornly large portion of the labor force. There seems to be phenomena at play not receiving attention—the interaction between the contestability of jobs and the complacency of jobs. The “complacency of jobs” refers to the lack of incentive to work for lower wages than a worker’s perceived skill set deserves. Someone who lost a relatively high-paying job during the Great Recession might be less likely to accept a low wage simply for the sake of having a job. A lack of motivation, or holding out for a higher wage may begin to explain the declining unemployment rate and the plummeting labor-force participation rate the United States has today. The lack of financial incentive to take a job leaves both the person out of work (and either in the ranks of the unemployed or out of the labor force) and the company with a job opening. A refusal to work for a perceived low wage should eventually have the effect of pushing wages higher, but this has not been the case so far. There are other factors working against the numbers as well. In a “normal” economic recovery, there is the expectation that as the labor market tightens, wages increase. This encourages people to switch jobs or even reenter the labor force. Theoretically, the job opening above would increase the salary or hourly until it was filled. But wages do not seem to be moving even as the unemployment rate falls. This is why contestability matters. Jobs are lost en masse during recessions. Companies shed workers to remain profitable (or solvent) in the downturn, and some get hired back. This may be changing, though. As a wide array of U.S. and developed-world jobs come under attack from automation, global high-speed internet connectivity, and the emerging cheap but highly educated labor force willing to perform skilled work for low wages, many people are simply not going to be paid as much to do what they are doing. This is exacerbated by a strengthening U.S. dollar that makes foreign labor appear more attractive. Labor is being priced on the world market, not the local market. And this suppresses wages below where they would be in a closed economy. The global economy is setting a wage ceiling in many U.S. jobs, and recruiters and hiring managers understand that many jobs can be filled abroad. The contestability of labor is keeping wages low, even as unemployment falls, because many jobs can be automated or outsourced if wages rise too much. Wages are pressured, even as fewer workers are chasing the same job in the United States, because there is a global workforce chasing those jobs as well. There is another factor at work in the United States—part-time employment—and its multidecade rise as a proportion of the labor force. Typically, the U.S. economy could rely on increased productivity to pick up the slack from fewer workers. The growth equation of more workers making more and more stuff per hour appears to be slowing. The shifting composition of the labor force with more part-time and fewer full-time employees could explain some of the slowdown in productivity. Part-time employees may be less efficient and have lower levels of productivity. And part-time employment increased during the Great Recession and remains high today. In many ways, the United States is fertile ground for the kind of jobs created by Uber. Uber allows for part-time and flexible hours, the jobs are noncontestable (at least until there are self-driving cars), and the complacency factor is counteracted by surge pricing. A recent Economist article suggested the world is divided “between people who have money but no time and people who have time but no money.” Without an emphasis on creating low-contestability jobs (like construction and those in the oil patch—you cannot replace an oil worker with a robot—yet) that are low complacency (oil-field jobs also pay a lot relative to other jobs requiring a similar skill set), it is difficult to see how this trend reverses. Instead, the U.S. labor market is reacting rationally to a changing world—one where wages feel little pressure and people hold out for better jobs. The equilibrium between wages, employment and participation will eventually be found. For now, though, the United States is becoming increasingly idle. FOR central banks in the rich world, two is a magic number. If prices rise at 2% a year, most shoppers can more or less ignore their slow ascent. And a touch of inflation is hugely helpful: it gives bosses a way to nudge unproductive workers—a pay freeze actually means a 2% cut—and an incentive to invest their earnings. Most importantly it keeps economies away from deflation and the depressing choices—hoarding cash, delaying purchases—that falling prices can bring. Yet despite the professed adherence to the 2% mantra, a period of falling prices is on the cards. The whiff of deflation is everywhere (see chart 1). Even in America, Britain and Canada—all growing at more than 2%—inflation is well below target. Prices are cooling in the east, with Chinese inflation a meagre 0.8%. Japan’s 2.4% rate is set to evaporate, as it slips back into deflation; Thailand is already there. But it is the euro zone that is most striking. Its inflationary past—price rises averaged 11% a year in Italy and 20% in Greece in the 1980s—is a distant memory. Today 15 of the area’s 19 members are in deflation; the highest inflation rate, in Austria, is just 1%. Oil explains a lot. A year ago a barrel of Brent crude cost $110; today it is $60. This 45% price cut is trickling through economies. In Britain data released on February 17th showed that tumbling energy and transport prices had helped deliver an inflation rate of 0.3% in the year to January, one of the lowest on record. In America the price of gasoline has fallen by 35% over the past six months; the cost of diesel and heating oil is down, too. This is not—in itself—a bad thing. Since winter energy use is a necessity, consumers are better off with cut-price fuel. Firms are cheering, too. As well as lower energy bills, the cost of inputs, from plastic bottles to detergent, are edging down. Some of the savings are being passed on: food, which is costly to transport and requires a lot of packaging, is cheapening. 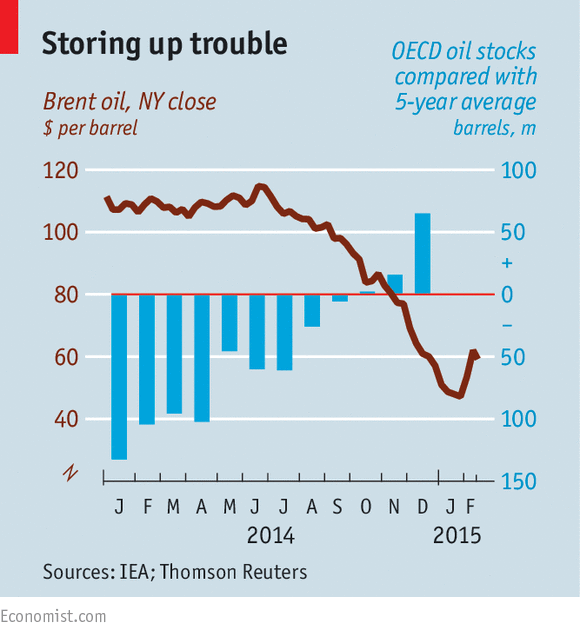 These are the hallmarks of a positive supply shock: cheap oil means economies can provide more goods at lower prices. In the services sector, which relies much less on energy, transport and oil-based inputs, prices are still rising (see chart 2). For those selling durable goods, deflation may seem more worrying. The price of new cars is flat in Britain, slowly sliding in Portugal and tumbling in Greece, where a new motor is nearly 20% cheaper than in 2005. For many industries, however, falling prices are not new, but a way of life. In the euro zone the prices of phones, computers and cameras have been falling for a decade (in Spain telephone equipment is 90% cheaper than ten years ago), so deflation is unlikely to shock shoppers. Even in Japan, which has seen years of falling prices, there is little evidence purchases are being put off. The boost to purchasing power from a short period of falling prices is welcome. In the rich world, pay rises have been rare despite huge improvements in employment. Since early 2010 more than 10m American workers have found jobs, as unemployment, which peaked at over 15m, has fallen by 40%. Japan has seen a similarly big drop, from 3.6m to 2.3m. Britain has done even better, slashing the ranks of its jobless by 50% to just 800,000. Even the sickly euro zone has added some jobs. The puzzle is why rising employment has not led to inflation in the form of higher pay. Unemployment rates in America, Britain and Japan—all of them at or below pre-crisis lows—would previously have triggered rising wages. But all three have seen growth in insecure forms of employment: part-time work has risen, as have the ranks of the “underemployed”, who would like more hours if they could get them. As looser contracts have helped create flexible workforces, casual work—from drivers for Uber to day labourers in construction—has boomed. Jobs may be up, but workers’ bargaining power is not. The drawbacks of these newly flexible labour markets are beginning to prompt a political backlash. Barack Obama has urged Congress to raise America’s minimum wage from $7.25 to $10.10. In Britain, both main parties plan to clarify when insecure “zero hours” contracts are abusive. Shinzo Abe, Japan’s prime minister, recently announced that temporary workers should expect the same deals as their permanent colleagues. As these steps lift pay and firms’ costs, inflation should follow. But even if it is short-lived, this sort of deflation can dull an economy. With inflation at 2% a boss sitting on a cash pile has a clear choice: invest it in something that returns more or give it back to the shareholders as dividends. Either step—boosting investment or investors’ incomes—is a good one. But when prices flatline, risk-averse bosses can justifiably sit on funds. With higher inflation, corporate cash piles—which reached $2 trillion in America and ¥229 trillion ($2.1 trillion) in Japan in 2014—would be more quickly put to use. 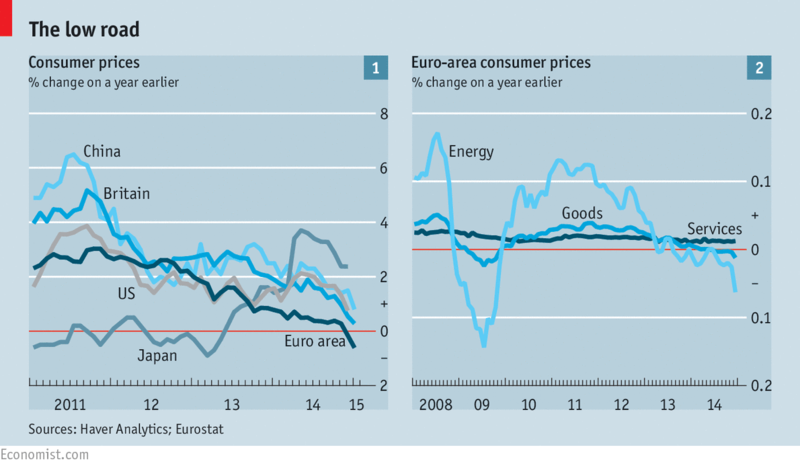 The euro zone is a different story. Apart from Germany, its members have done little to make labour markets efficient; most have masses of spare capacity. In late 2009 the unemployment rate was just under 10%, the same as America’s. But since then joblessness has risen in the euro area and is now 11%. In Greece, it is close to 25%. It will take years to overcome this: even if Spain, lauded for its 2% growth rate, carries on at its current pace it will take eight years for unemployment to reach its pre-crisis rate. Those seeking higher pay have scant hope. That makes the risk of long-lasting deflation more of a worry than elsewhere. If falling prices endure, then debts, fixed in nominal terms, are harder to pay. A recent study by McKinsey, a consultancy, tracked total debt—government, household and corporate—between 2007 and 2014. Euro-zone economies lead the charge, with debt up by 55 percentage points of GDP or more in five troubled “peripheral” states and three “core” ones. If incomes consistently fall those debts may become impossible to pay. Central banks are at last leaping into action. The European Central Bank (ECB) has been late to the game on quantitative easing (QE) but will begin creating money to buy government debt in March. The Bank of Japan is committed to as much QE as it takes to get inflation back to 2%. A new and radical policy—negative interest rates—is becoming fashionable, with Nordic central banks following the ECB in adopting it (see Free exchange). If these attempts fail, then the glee at cheap food and fuel will be short-lived, as debt-ridden economies find themselves using up all the savings from falling prices to keep creditors at bay. Does Economic Stagnation Create Dangerous Financial Bubbles? "Fed members who supported an early move said they were concerned that holding rates low for too long might lead to asset bubbles." So the Federal Reserve is not raising interest rates in the near term, because the economy is still too fragile and weak to handle interest rates above (effectively) zero percent. Yet what they also fear is that this weak economy will generate stratospheric market prices (i.e. asset bubbles) that could be prone to sudden collapse, which could pose acute risks to the economy, global stability, and investment returns. That may all sound counterintuitive, as it would seem to make sense that a weak economy should naturally lead to weak markets and falling prices, whereas it's a strong and healthy economy that should create rapidly rising market prices. However, as explored by some prominent global economists in the recent e-book, "Secular Stagnation: Facts, Causes and Cures", edited by Coen Teulings and Richard Baldwin, the creation of financial bubbles may indeed be the quite likely and expected result of current government policies around the world for dealing with stagnant economies and persistent unemployment. Indeed, the term "rational bubbles" is used to explain the rational reasons for why weak economic times are particularly likely to create irrational prices that foster financial instability. This then raises an interesting and quite timely question: is the Standard & Poor's 500 stock index above 2,000 and the Dow above 18,000 in spite of still weak economic growth and persistent unemployment problems? Or are stock markets soaring to record levels specifically because of the underlying problems and the government's interventions which attempt to fix those problems? Most investors would likely agree that with stock indexes in record territory, it is critically important to be able to distinguish between whether the source is 1) the rational result of a thriving economy; or instead 2) the kind of financial bubble that can rationally be expected to be created specifically because of a persistently underperforming economy. So let's take a closer look at why it is that struggling economies can be expected to produce irrationally soaring stock markets and other financial bubbles. In a previous article, I discussed the general implications of an important new book released by the Centre for Economic Policy Research (CEPR), which suggests that the world has entered a "new normal" of secular stagnation (with secular being economics jargon for long term), with slow economic growth, an indefinite continuation of very low interest rates and - as a matter of deliberate governmental policy - persistent negative investor returns in inflation-adjusted terms. The contributors to "Secular Stagnation" include Lawrence Summers and Paul Krugman, as well as numerous economists from such institutions as Harvard, MIT, Oxford, Cambridge, the International Monetary Fund and also the Principal Economist for the Executive Board of the European Central Bank. However, while the face of secular stagnation is one of sustained and almost inescapable low yields - both for fixed income investors as well as the long-term economic growth which underlies rational stock market valuations - there is a glittering exception to this rule. That is, what concerns these economists is that this environment of sustained very low interest rates combined with few good investment opportunities can be expected to foster the creation of financial bubbles and financial instability. So that in the short term - and possibly even lasting for years - enormous paper wealth is created as a direct result of secular stagnation, until the bubble finally pops (as they always eventually do) at which time enormous economic and financial damage is inflicted on both investors as well as the financial system. The danger is described by Lawrence Summers (Treasury Secretary in the Clinton administration, and former Director of the National Economic Council in the Obama administration) on pages 32-33 of the book. "Low nominal and real interest rates undermine financial stability in various ways. They increase risk-taking as investors reach for yield, promote irresponsible lending as coupon obligations become very low and easy to meet, and make Ponzi financial structures more attractive as interest rates look low relative to expected growth rates. So it is possible that even if interest rates are not constrained by the zero lower bound, efforts to lower them to the point where cyclical performance is satisfactory will give rise to financial stability problems. Something of this kind was surely at work during the 2003-2007 period." Teulings and Baldwin considered the issue of "bubbles and low interest rates" to be one of the key new challenges created by secular stagnation (SecStag), and they devoted the entire third section of their introduction to the matter. The following quotations are from pages 13 and 14. "Beyond ZLB issues, which have been the main concern in the SecStag discussion to date, low real rates can produce bubbles and foster financial instability - as Summers argues forcefully in his chapter. When the real rate, r, falls to values close to the economy's growth rate, g, asset prices start to explode in a 'rational' way (as pointed out by Tirole 1985)." "Bubbles are an alternative way for society to deal with excess saving when fiscal policy does not take up the challenge. Buying bubbly assets with the intention of selling them at a later date is an alternative route of saving for future consumption. When nobody wants to invest because r is below g, and hence buys bubbly assets, the price of these assets goes up, yielding windfall profits to their sellers who are therefore able to increase their consumption. This additional consumption restores the balance between supply and demand for loanable funds on the capital market." "A greater supply of savings is one of the Wicksellian forces pushing the real interest rate down. Hence, ageing societies might run a greater risk of bubbles popping up." To expand upon these brief quotations, there are several interrelated components which can work together in an environment of secular stagnation to create a financial bubble - or a series of financial bubbles. While Central Bank interventions mean there is a large supply of low-cost money available to invest - where does one put it if we're looking at fundamental valuations? Interest rates are very low and are indeed negative on an inflation-adjusted basis as a matter of quite deliberate governmental policy, as further explored here. Economic performance is erratic at best, unable to deliver sustained and powerful economic growth, thereby eliminating much of the fundamentals-based premise for the valuation of stocks. There just don't seem to be any good investment alternatives. Another element - and one of the reasons why some believe that secular stagnation could be our indefinite future - is the globe's aging population, particularly in Europe, and to a lesser extent in the United States. As the population ages, their economic productivity is likely to be falling, even as their consumption which drives future economic growth is also likely to be falling. Simultaneously, they have the largest amounts to invest in their latter years before retirement and in early retirement that they have ever had. So productivity and consumption each fall while investable funds are peaking, thereby exacerbating the problem of a large supply of money seeking homes in what is otherwise a low yield environment. And what happens as a result is that we get upward price movement in a given asset category. As the prices climb upwards, this starts to produce a level of yields that are simply not available anywhere else. These attractive yields bring in new investors, which increases the prices, which then increases the yields while reinforcing the pattern, which in turn brings in the next round of money. This pattern of rising prices drawing in money which fuels further rising prices - until rational valuations have been left far behind - is one of the oldest and most reliable stories in the history of finance and markets. What is different this time around is the ready supply of cheap money, in combination with the lack of fundamental alternatives for investment, along with a large pool of older investors who are desperate for yield alternatives and are seeing attractive yields being created. While it may seem counterintuitive at first, these factors are all accelerants and in combination become the perfect recipe for creating a financial bubble. And as discussed in "Secular Stagnation", these leading economists - whose policy advice is responsible for so many nations around the world adopting very low interest rate policies as an attempted cure for economic stagnation - are also perfectly well aware that these same economic strategies are creating an ideal environment for the creation and feeding of financial bubbles and financial instability. Is Secular Stagnation The Source Of Current Stock Index Highs? How central bank policies, which create a combination of 1) low interest rates, 2) no premiums for risk and 3) the chance of bubbles, are a recipe for a potential nightmare scenario for retirement and other long-term investors. U.S. dietary guidelines, the government’s benchmark for balanced nutrition, have long advised Americans to eat dark, leafy greens. Now, there is another way the standards could be going green. A panel of nutrition experts recruited by the Obama administration to help craft the next set of guidelines, to be issued this year, said in long-awaited recommendations Thursday that the government should consider the environment when deciding what people should eat. The panel, in a departure from a decades-old recommendation, also said dietary cholesterol was no longer a big concern: It scrapped guidance that Americans limit their cholesterol intake to no more than 300 milligrams a day—less than that found in a couple of eggs. The panel said consuming three to five cups of coffee a day can reduce the risk of Type 2 diabetes and cardiovascular disease. It endorsed the idea that moderate amounts of alcohol were beneficial for some people. Generally speaking, the environmental focus means endorsing a diet that includes limited amounts of meat and more plant-based foods, while also encouraging the consumption of seafood whose stocks aren’t threatened. “Addressing this complete challenge is essential to ensure a healthy food supply will be available for future generations,” the Dietary Guidelines Advisory Committee, a panel of roughly a dozen academics and nutrition experts, said in its recommendations to the U.S. Department of Agriculture and the Department of Health and Human Services. The guidance will be used by those departments to revise the dietary guidelines, issued by the federal government about every five years and represented as color-coded food groups on a plate. 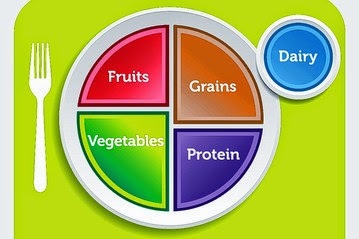 The MyPlate symbol replaced the food pyramid in 2011. After two decades, the federal government has decided to serve nutrition advice on a plate instead of a pyramid. The U.S. Department of Agriculture introduced the plate-shaped icon Thursday to replace the pyramid that often was criticized as confusing. The plate's sections show the recommended food groups, with fruits and vegetables taking up half the dish. The plate, which follows the government's revised nutrition guidelines released in January, won praise from nutrition advocates and food industry groups. "People don't eat off a pyramid, they eat off a plate," said Dawn Jackson Blatner, a registered dietitian in Chicago. The USDA's first version of the food pyramid came out in 1992. With carbohydrates such as bread and spaghetti occupying a band along the base, it gave far less space to fruits and vegetables. It also suggested eating fats "sparingly," which nutritional experts said ignored the benefits of foods with healthier forms of fat. When the government updated the advice in 2005, a new icon omitted specific portion advice, but the pyramid persisted. It left many people baffled as to what the government was trying to convey. The new icon seeks to clarify: Fruits and vegetables should make up half the diet, with vegetables taking up a majority of the half. Grains and proteins (meat and fish, for example) should occupy the other half, with grains taking up a majority of that half. Like the new guidelines, the plate stresses balanced portion sizes for Americans, who only grew more obese since the government's food pyramid debuted. The USDA has been issuing dietary guidance for more than a century, but until 1992 it didn't have a standard icon to display the advice. One graphic from the 1980s called the Food Wheel bears some resemblance to the new plate, showing a pie chart with slices representing each of the major food groups. More detailed advice is available in the full nutrition guidelines at ChooseMyPlate.gov. The guidelines say people should avoid processed foods that are heavy in salt, drink water instead of sugary drinks, and step up fish consumption while depending less on red meat. First lady Michelle Obama, who has sought to make childhood obesity her signature cause, helped to introduce the plate in Washington. "This is a quick, simple reminder for all of us to be more mindful of the foods that we're eating, and as a mom I can already tell how much this is going to help parents across the country," Mrs. Obama said. The overall cost of the initiative was approximately $2.9 million over a three-year period, a USDA spokeswoman said. Food companies applauded the new symbol and stressed their efforts to put healthier products on grocery shelves. "The new MyPlate icon is certainly more practical and intuitive than the previous My Pyramid icon," said Juli Mandel Sloves, a spokeswoman for Campbell Soup Co. The Center for Science in the Public Interest, a nonprofit group that sometimes tussles with the food industry, called the plate a "huge improvement over the inscrutable food pyramid." "It likely will shock most people into recognizing that they need to eat a heck of a lot more vegetables and fruits," said the center's Margo Wootan. "Most people are eating about a quarter of a plate of fruits or vegetables, not a half a plate as recommended." The new USDA icon makes no mention of meat specifically, but American Meat Institute Foundation President James Hodges said beef, pork and poultry are "some of the most nutrient-rich foods available." The plate graphic, he said, "affirms the role that meat and poultry play in a healthy diet, while emphasizing underconsumed food groups." —Katherine Hobson contributed to this article. Mark your diaries. Greece and the eurozone agreed Friday to a four-month extension to the country’s current financing package. In reality, there are further tests to come. The first notable date arrives very quickly. Monday marks the deadline for the Greek government to submit a list of reforms that will be reviewed by the International Monetary Fund and European Commission to see if they form a basis for proceeding. Only after that would national parliaments, where necessary, move to approve the extension. In other words, Greece doesn’t have an extension yet and it won’t see any financing for some time. Eurozone finance ministers had previously said it wasn’t clear what Greece wanted to do. Monday should finally bring some welcome clarity. The second date to watch is the end of April, which marks the deadline for these reforms to be set out in detail. That might then allow for Greece to receive delayed disbursements from its existing financing agreement. The oil price has been rising again—but will it last? STAGE one of Saudi Arabia’s plan—or perhaps hope—to restructure the oil market is taking longer than expected. By refusing to rein in production while prices fell, the Saudis permitted a big surplus to grow and served notice on higher-cost rivals (Russia, Venezuela, American shale-oil producers) that they would not prop up other people’s profit margins at the expense of their own market share. That signal has been weakened by the growing amount of oil in storage, which is absorbing most of the glut. World oil stocks rose by about 265m barrels last year and Société Générale, a French bank, reckons they will increase by a further 1.6m-1.8m barrels a day (b/d) in the first six months of this year, adding roughly 300m barrels to the total. Oil is being stored in the hope that demand and prices will pick up later. Such restocking, plus renewed political worries (flows from Libya’s largest oilfield were disrupted again this week by apparent sabotage), have pushed the price of oil back up. After having fallen by more than 60% since June, the price of a barrel of Brent crude closed at $59.96 on February 18th. The restocking cannot continue for long. Storage facilities in Europe and Asia are already 80-85% full. Much more and they will overflow. As it is, companies are renting tankers to keep oil in. If storage space runs out, prices could tumble again. Whether that happens depends on how quickly phase two of the Saudi plan gets under way. This is to force high-cost producers out to increase the influence of Gulf countries. At the moment, this is happening only slowly. Oil types have recently become obsessed with the so-called “rig count”—the number of drilling rigs operating in America and elsewhere. Analysts think that as the rig count declines, shale-oil output will fall, hurting profits and investment. Figures from Baker Hughes, an oil-services company, showed that the rig count in America in mid-February fell to its lowest since 2011, and was 35% below its peak in October 2014. That is a big fall. But most of the idled rigs are in marginal areas; the fall has been only 9% in the main shale-oil basins, in North Dakota and Texas, which accounted for four-fifths of the increase in American oil output in the past two years. Moreover, productivity is rising in the remaining wells. Citibank reckons that even a 50% fall in the rig count would allow output to rise this year and turn the average shale firm’s cashflow positive, encouraging investment. More broadly, says Antoine Halff of the International Energy Agency, an inter-governmental body, “The market sentiment may have changed but the fundamentals have not.” The Organisation of the Petroleum Exporting Countries (OPEC) says its members’ output will rise by 400,000 b/d this year; others think the increase will be greater. Non-OPEC supplies are likely to rise by twice that. Thanks partly to cheaper oil, world demand is rising, but not by much. The IEA reckons demand will be flat in the first half of 2015, before rising by 2m b/d in the second. By most estimates, the market will be oversupplied for a while. In the long run, there are signs that oilmen believe the decline in prices will be lasting, which should prompt a broader restructuring of the industry. Large oil firms have announced cuts in capital spending of over 20% for this year. BP, for example, will spend $20 billion in capital projects in 2015, compared with $23 billion in 2014. As it is, new discoveries are also falling precipitously. According to IHS, a research firm, new finds of oil and gas amounted to the equivalent of 16 billion barrels last year, the lowest for 60 years. That will cheer the Saudi strategists.